For those of you who follow me on instagram (dwellingsbydevore), you already know what I was up to this weekend. I've wanted to paint my daughter's bathroom vanity for a while now, but never got around to it. Well this weekend I got it done. I thought about going with white paint, but where's the fun in that? 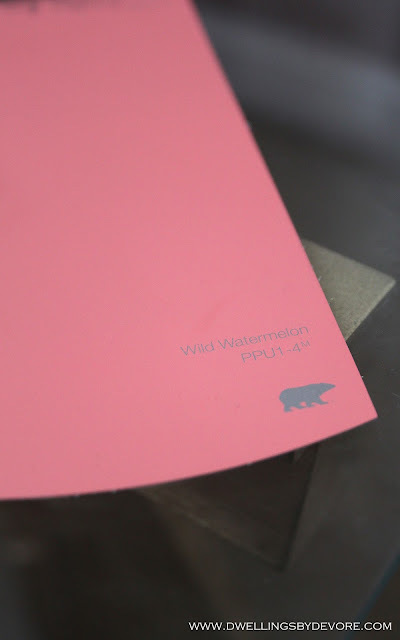 I settled on behr wild watermelon. It's really hard to tell from those small swatches sometimes, but I had a feeling this would be the perfect shade I was looking for. Thankfully I was right. It's not too peachy and not to bubblgum, it's just a good shade of coral pink. Here's a little before of the vanity before. It wasn't terrible and was in great shape, but it was pretty builder bland. 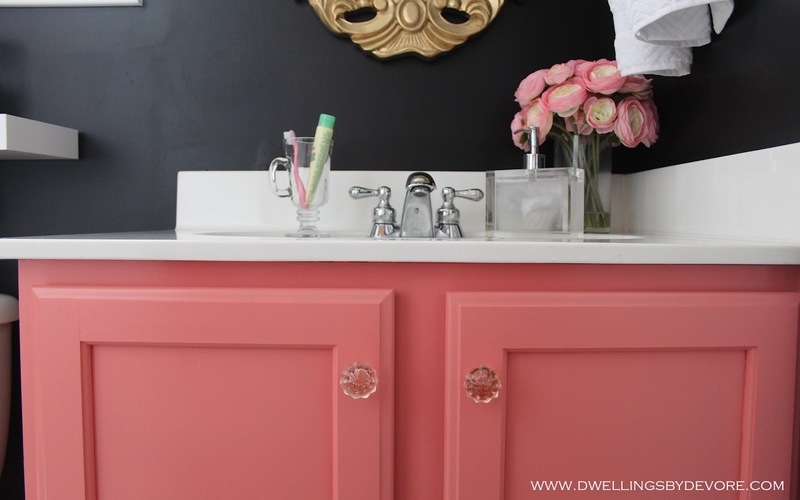 Here's the steps I would recommend following if you plan to paint a vanity in your home. 1. Sand everything down and then clean it really well. 3. Start painting. It took me a few coats to get things nice and even. I paint the nooks and crannies first with a brush and then roll over everything with a foam roller. I used a semi gloss finish so that I could avoid having to use a topcoat and still have some durability and wipe ability which is always nice in a bathroom. The only other thing I would say is to wait the recommended amount of dry time before you re-coat. Even if it's dry to the touch it doesn't mean it's ready for another coat. I think the pink makes it more fun and playful since the black walls are a little more sophisticated for a kids' space. 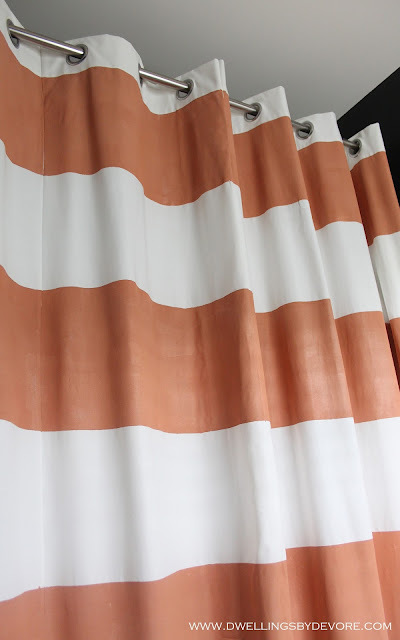 I'm working on a window treatment to add a little more whimsy too. I've made a lot of changes in this room lately so I thought I'd include a few pictures of other details in the room and update my home tour of this room. 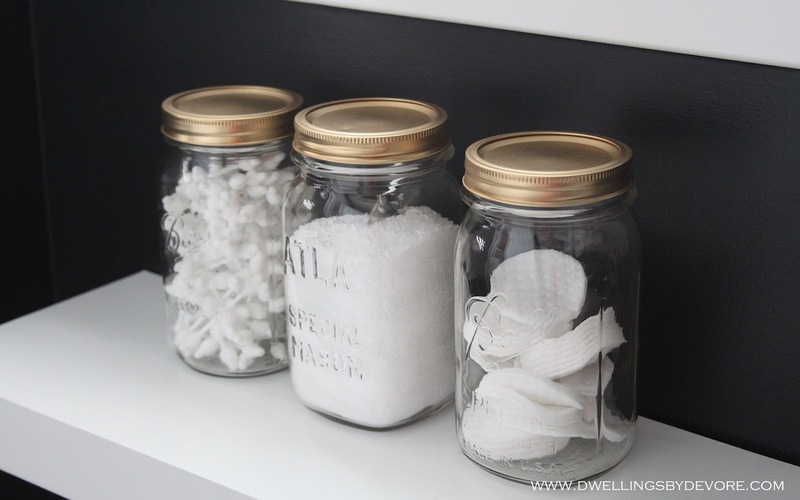 I'm also linking up to Emily Clark's kids' spaces link up. It's beautiful! I love the pink vanity and all of the personal touches like the quote on the mirror. Great job! I love it! I've been contemplating this for a while now. I'm officially inspired!!! It looks awesome! 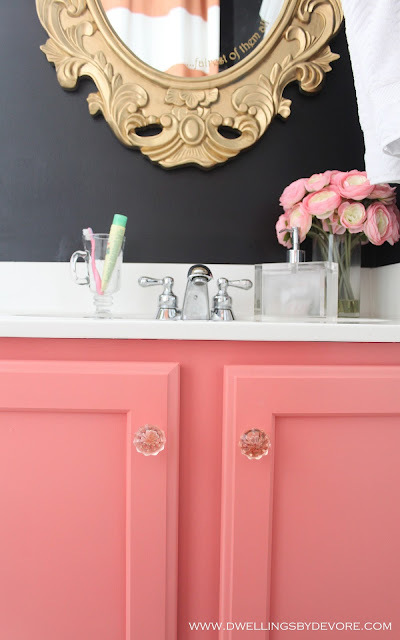 Love your little girl's bathroom- it could totally be the adjoining one for my little girl's nursery that I just posted on Emily's blog...that's how I found you! Cute blog! Girl, you are GIFTED!! Pretty much every time I start reading one of your posts, I always start with the same thought: "How could she possibly improve on this room/furniture/etc, it's already amazing!" and then somehow you find even MORE amazing-ness! I completely smitten with this bathroom and it is perfect for a little girl. The pink vanity is beautiful! Your new vanity just took your bathroom totally over the top! It was gorgeous already and now it's just so dramatic! I'm loving those sea fans also. Gorgeous! 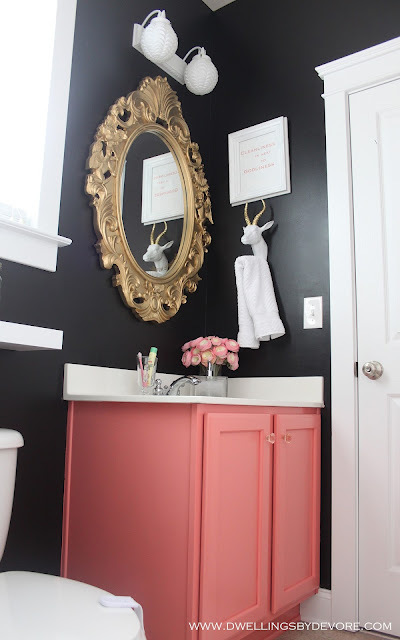 I just love the black walls and new pink vanity!!! Beautiful! Just found your blog over Instagram...so glad I did!! you're so funny :) Thank you!! Thank you! I just check out your kids' rooms and love them all! Just link up :) Thanks marty! 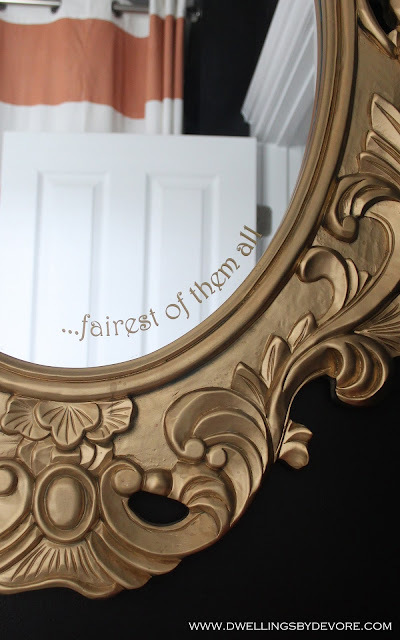 I was having trouble commenting yesterday :( had to come back and tell you how fabulous it is! 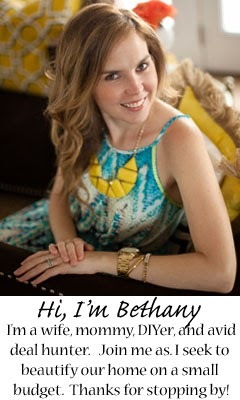 Bethany, the vanity turned out great! 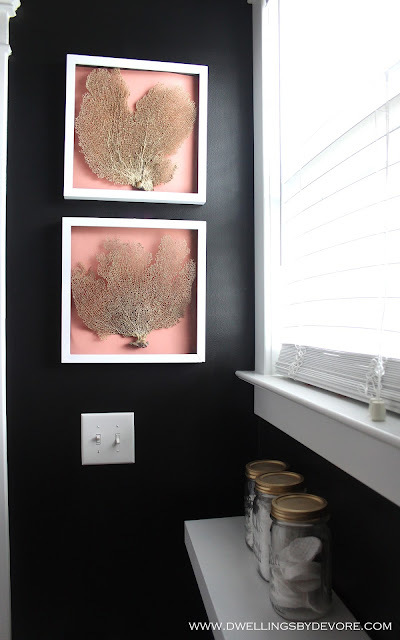 I really like the Behr Wild Watermelon with the black walls. I'd love to feature this on my paint color blog, Involving Color. Let me know if you're interested! SO cute!! I LOVE that you painted the vanity coral. It turned out so well. The bathroom really looks great! 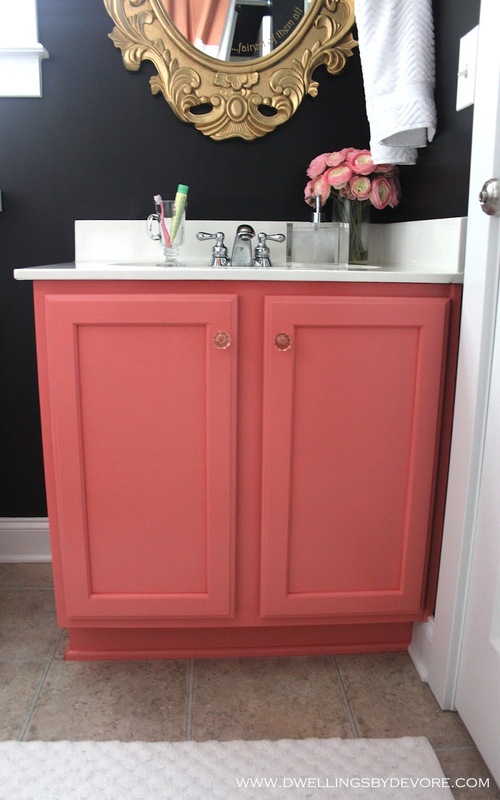 this makes me want to paint a bathroom cabinet...STAT! such a beautiful job! What paint sheen did you use on the black walls? It all turned out beautifully! Thank you! I used eggshell. Saw this room over on Emily Clark's blog. What a fun vanity color! Love the black walls too. 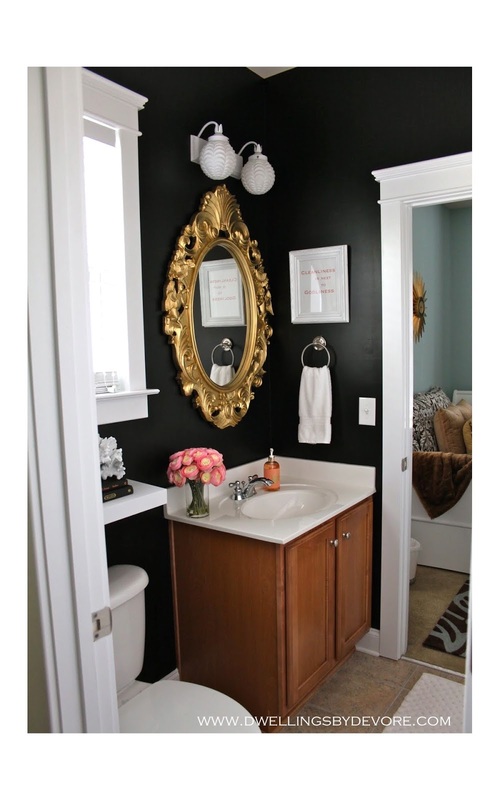 I recently painted my powder room walls almost-black and they really class up the space. Love this!!!! 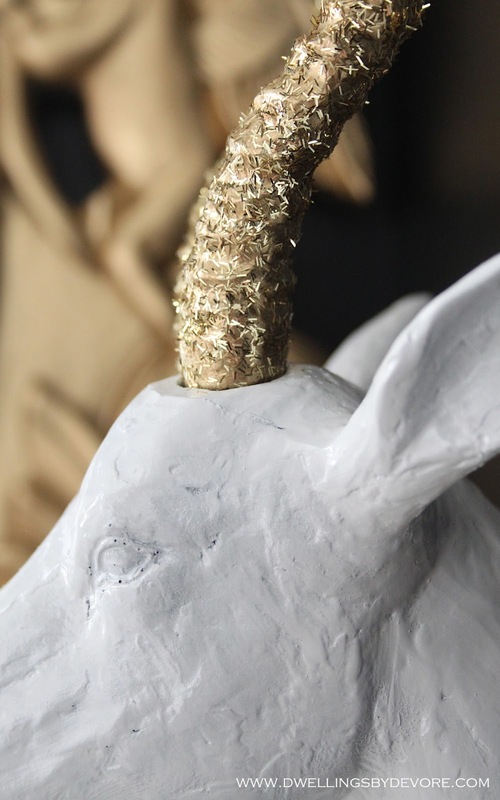 Can I ask where you found the glittered taxidermy towel hook at???? Thanks so much! I agree, dark walls are so classy! The kind of pink color used is not bad and I love the shade. I think this looks better in girls personal bathroom since it looks so girly. I like the designs as well. dazzling work has won my heart. I’ll come soon to your site with new hope. fan of your blog!! I love writing way that’s awesome. and will really help me in future too!